Auto rim replacement is too expensive to be done if you can repair your current rims. Fortunately, repairing bent auto rims is usually possible. 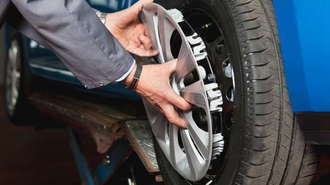 Auto rims are notoriously expensive to purchase, and to replace and repair as well. Because of this, many people will leave a bent rim without repairing it. Rim repair can be necessary for a number of reasons; if you've driven the vehicle up against a curb or another hard object, your rim will likely be scratched at best and, depending upon the type of rim and how fast you were driving, may also be bent out of shape. Read on for a brief set of guidelines on how to repair bent auto rims. One of the most difficult parts of repairing a rim is getting it off of the wheel in the first place. Because rims are designed to be fit securely to the wheels, they can be hard to remove. In order to do so, you should plan to either use a prybar to remove the rim from the wheel after you've jacked up the car and removed the wheel itself, or you should take the tire in to a professional service to have them remove the rim. The cost of the latter of these is often well worth the peace of mind, as it's very easy to further damage the rim or cause damage to the tire if you try to pry the rim off yourself. In order to repair the bent rim, you'll need to heat a small portion of it with the blow torch and then hammer out the bent portion against the wood plank. This will take some practice in order to be able to do effectively, so you may find that it's beneficial to practice on a different piece of equally thick metal before you attempt the rim. Heat the blowtorch to the highest setting, then train it on one small area of the rim for about two minutes. While the rim is hot, hold it up against the plank and pound it out with the mallet in order to smooth out any bent areas. While doing this, it's crucial that you wear protective gloves and other protective equipment. This procedure can be dangerous if done incorrectly, and it's not worthwhile to cause harm to yourself while you're working to repair a rim. Be prepared to reheat and hammer the rim out several times in order to get it back to its original shape.